Late March and early April mark the start of the fishing season for cobia in the Gulf. Also known as the lemonfish, the migration into the Gulf waters is an event that many fishermen get excited for year after year. Since cobia grow rapidly and can weigh more than 100 pounds, they are a prize for experts and novices alike. You will recognize the cobia by their flattened head, sharp spines and forked tail. The upper side of the body is dark brown, the sides are a lighter brown while the belly is white. If you see a young cobia, you might also notice a black lateral band that runs the length of the fish’s body. To catch a cobia, it is important to first spot the fish in the water. A big advantage of taking to the seas with The Triple Trouble in Orange Beach, Alabama, is the use of professional equipment and visibility that fishing from aboard a large vessel provides, allowing you to better spot the fish from afar. Since cobia swim just beneath the surface, you will be able to observe if the fish are in a group or by themselves. You may even spot turtles and rays swimming near the cobia. Fortunately, cobia are attracted to buoys and floating debris the in the water, which can help anglers find them. They also seek shelter from predators in weedlines. According to the University of Southern Mississippi’s Gulf Coast Research Laboratory, some examinations of the cobia’s stomach have shown them to be opportunistic feeders, but with a specific preference for crabs, squid and various fish species. As a result, many fishermen prefer to use live eels and specialized cobia jigs for bait. Although it is typically thought that fishing during cloudy weather is better, an ideal cobia fishing trip would be on a cloudless, sunny day, giving you improved visibility of these fish grouping in the water. Plan your cobia fishing charter with The Triple Trouble now as dates are booking up fast, and you want to hit the Gulf early to have the best chance of catching a prized fish. Call Capt. 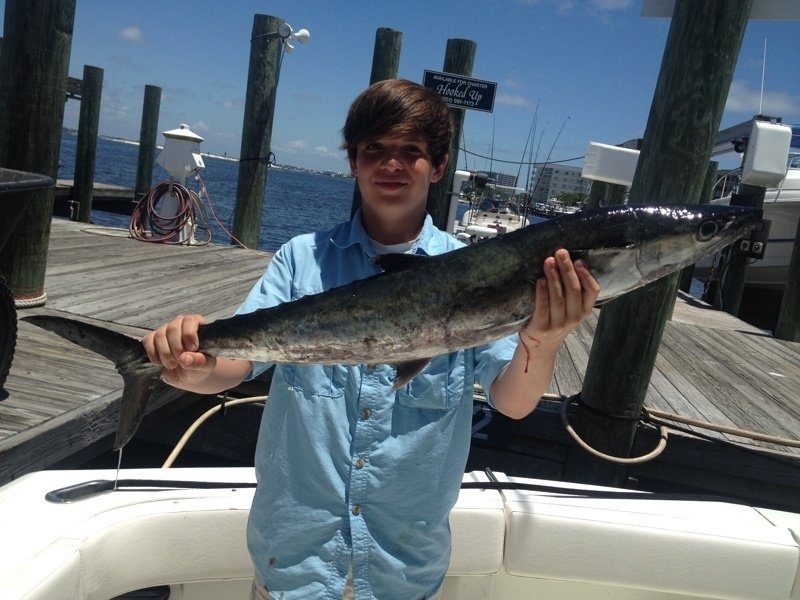 Chad at 256-431-5767 now and book your deep sea fishing charter in Orange Beach today.